CENTER CITY (WPVI) -- Philadelphia police are searching for a suspect who robbed a Wells Fargo bank in Center City. The robbery occurred around 2:40 p.m. Thursday at the Wells Fargo on the 2000 block of Market Street. 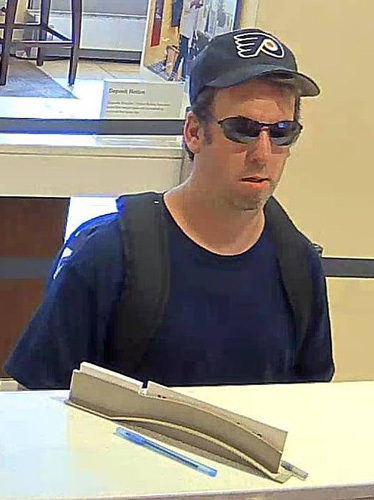 Police say the suspect entered the bank and handed a demand note the teller. 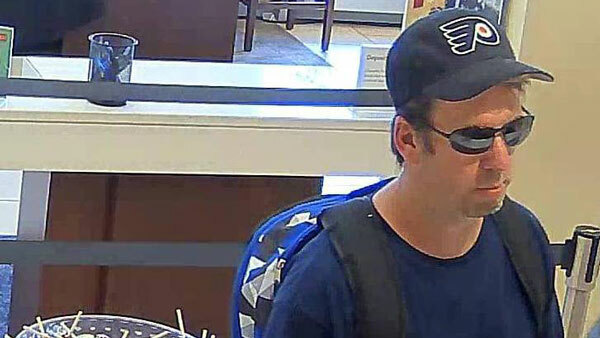 After obtaining an undisclosed amount of cash, the suspect fled the area of the bank. The suspect is described as a white male in his early 30s, approximately 5'5-5'6 tall, brown hair, unshaven with facial stubble. He wore a dark blue Flyers baseball cap, sunglasses, a blue t-shirt, dark blue basketball shorts, and sneakers. This suspect is considered armed and dangerous. Anyone with information about this robbery or the suspect is urged to call the FBI at 215-418-4000 or the Philadelphia Police Department. There is a reward for information leading to his arrest.